In the Properties window, set the Attachment’s Attachment/Position to 0, 5, 0. This is the position of the Attachment relative to the parent Part. We want particles to be centered on our attachment. So, set the ParticleEmitter’s ParticleEmitter/Speed to 0 so they don’t move. Additionally, if the Attachment moves, the particles should move with it. Enable LockedToPart so this happens. Next, set the ParticleEmitter’s ParticleEmitter/LightEmission to 1. This causes the particles to blend additively. Black sections of the texture will render transparently. Since portals give off light, they shouldn’t be affected by environment lighting. Set ParticleEmitter/LightInfluence to 0 as well. Swirls should fade out over a short time. Set the ParticleEmitter’s ParticleEmitter/Lifetime to 2 seconds. Select the ParticleEmitter/Transparency property and press the […] that appears. A graph will appear. The X axis represents the lifetime of a particle, and the Y axis represents the particle’s transparency. The particles should grow in size over time. Select the ParticleEmitter/Size property and click […]. Set the Size to tween from 0 to 5. We’re starting to get something that resembles a portal. Now we need the swirls to actually swirl. Set the ParticleEmitter/RotSpeed to -400, -320. The rotation speed is negative so that the particles spin counterclockwise, the direction of the swirl. 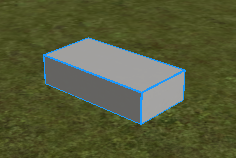 Set the Part’s BasePart/Transparency to 1 to hide it. Duplicate the portal from the steps above by pressing CTRL+D with the Part selected. Move the Part to the side of the original. Name the original Part “ExitPortal” and the copy “EntrancePortal”. Flip the ParticleEmitter/Transparency property. Tween from 1 to 0. Flip the ParticleEmitter/Size tween as well. Finally, negate the ParticleEmitter/RotSpeed property. Since the original range was -400 to -320, set it to 320 to 400 (negate and swap).